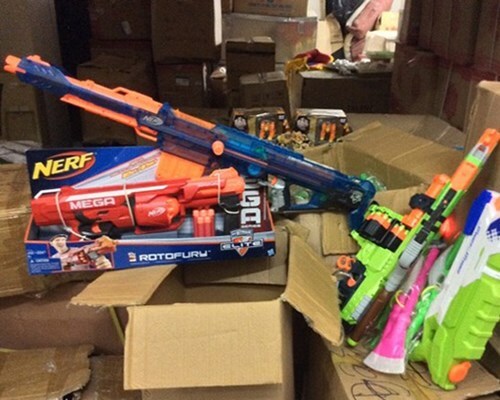 HA NOI (VNS) — The Ha Noi Market Watch, in co-operation with the municipal police, yesterday seized more than 3,000 smuggled unsafe toys. The move followed an ongoing week-long raid conducted by Ha Noi authorities to inspect the markets before the approaching Mid-Autumn Festival, a children's festival. The market watch team discovered the toys when examining the toy stalls on Hoan Kiem District's streets of Cau Dong, Hang Ca, Hong Ha and Ly Quoc Su, as well as Hang Ma and Nguyen Thien Thuat. During this inspection, the authorities also discovered more than 1,000 smuggled food products labeled as Chinese brands, comprising instant noodles, soy sauce, soft drinks and salted dried apricots, besides dried jelly. They were found in stalls in Hoan Kiem District's Nguyen Tu Gian Street.The owners of the toys and food products failed to produce legal invoices and certificates relating to the products' place of origin.